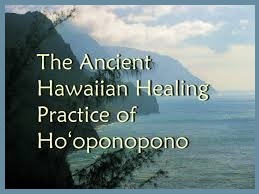 Ho’oponopono, pronounced “hoh oh pohno pohno is a Huna process that brings balance and harmony to one’s life. It can be practiced anywhere and many ways. This ancient healing practice was part of the long extended lomilomi training. However, modern simplified versions are now being taught in workshops to make this exercise journey of healing and peacemaking more assessable. 1. Begin lying down, rest left hand comfortably on the second chakra and the right hand on your heart. Breathe in through the nose and out through the mouth and relax into a normal breathing pattern. 2. Bring attention to someone you are feeling some disconnection or discord with and place them in a beautiful place and start sending out love to this person. Visualize your heart being connected to their heart with a magnificent rainbow of colors. 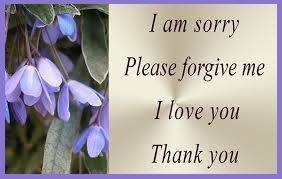 As you repeat these four statements, healing begins from within for yourself and the other person. Continue to repeat these statements as a mantra for as long as you feel it is needed. This is another excellent bedtime meditation.